An upper body physical anthropology portrait of a young man posed for the camera in front of a cloth backdrop against a brick wall, the number '20' attached to the sheet for identification purposes. He is wearing a small horn container (?for snuff) around his neck. 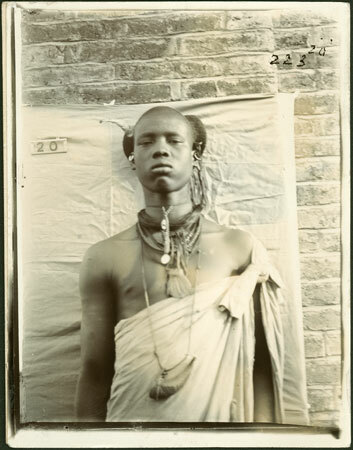 The Seligmans identified this youth as an 'average' Shilluk physical type in their publication. Notes on card mount ms pencil - "SS & RCS 8.89"
Morton, Chris. "Portrait of a Shilluk youth" Southern Sudan Project (in development). 03 Jan. 2006. Pitt Rivers Museum. <http://southernsudan.prm.ox.ac.uk/details/1998.348.23/>.